As one of the longest standing businesses in the Bloor West Village area, Marlborough’s has become a symbol of Bloor West Village’s continuous innovation amidst the changing retail environment. In 1970, Bloor West Village business owners founded their Business Improvement Area, the world’s first BIA, to collectively brainstorm ways to compete with the newly-built Cloverdale Mall they worried would woo their consumers away. And the concept caught on. Now there are BIAs across the world, 83 in Toronto specifically. But it was the fear of “the new mall” the digital space – Amazon – a threat to main street businesses everywhere that spurred Howitt, who has 25 years experience as a technology consultant, to join the BIA and eventually take the helm. On top of that, he explains, consumers are leaning more towards convenience. Online shopping has proven efficient and, in a lot of cases, cheaper. It’s not that most people don’t want to shop local, says Howitt, it’s just that when they go to look prices up on Google, Amazon and big box companies are going to show up first in the search results because they have the resources to pay for search engine optimization. “Mom and pop (businesses) don't have the money to be on the first page and even if they did pay, it's not guaranteed,” says Howitt. 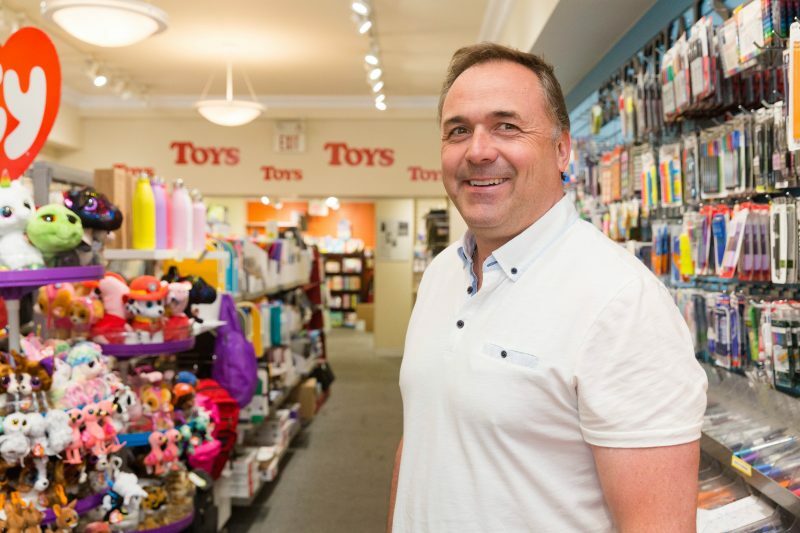 It’s something he and his wife Joanne, have increasingly grappled with since they took over Marlborough’s, a stationery and school supply store in the heart of Bloor West Village, from Joanne’s parents in 1997. Her family had bought it in 1967 from the Marlborough family who had opened in 1922. It’s a beacon of stability for the neighbourhood but even with a near century of presence, the slow creep of e-commerce has been suffocating at times. Luckily, the Howitts have had the wherewithal to put the digital tools in place for their shop and other businesses in the BIA to move towards a truly digital main street. How has Marlborough’s and the Bloor West Village BIA competed digitally? ShopCity has been invaluable says Howitt. Started by a company out of Midland, the platform – which allows local shoppers to browse and buy online, check-in, leave reviews, and connect with local businesses – has formed the backbone for the neighbourhood. “We stopped printing a directory and went to the online directory where we put all 400 or so businesses onto the ShopCity platform,” he says. Under the Marketplace Items feature, business owners can take a photograph of a product, describe it, and post it. “Google indexes that information and links my store to that brand through that search string,” he explains. Another game changing solution is PeopleFlow, a product by Spatial DNA that assigns anonymous tags to phones and tracks the flow of traffic in a neighbourhood. Using the platform, the BIA learned that while most businesses closed at 6:30pm, there was a rush of foot traffic between 6pm and 8pm. “We were able as a community and as a BIA to adjust our hours,” adds Howitt. On a more specific level, Marlborough’s found an ingenious way to use Amazon against itself. Over the past few years, the Howitts’ business has started selling educational kids toys, games, and puzzles. Joanne realized that when it came time to choose which products to source, she could go onto Amazon, find toys or games with a five star review, read the review, and then research whether Marlborough’s could compete with the price on Amazon by buying directly from their supplier. In a sense, innovation is at the heart of preserving main street. For mom and pop businesses to compete, they need to understand the tools companies like Amazon use, and figure out how to make them work for themselves.